Do you know that you can set shortcut to open any application in start menu. Yes, we can open any application in Start menu or on Desktop by pressing the shortcut key. Also Read: 2 Ways To Rename Multiple Files And Folders In Winodws. Click on the Start menu and select the application which you want to set the shortcut. I am Selecting the Ms office. Right Click on the Ms Office and open its properties. 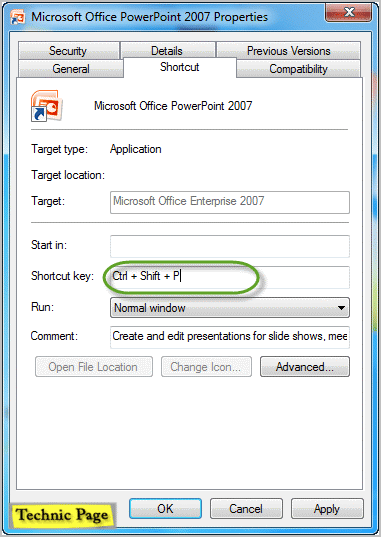 Now I want to set the shortcut as Ctrl + Shift + P to the MS Office. In the Properties window Press Ctrl + Shift + P and press Apply button to Save the settings. Now you can open your application by Pressing your shortcut. Hi Alison .. Thanks for your comment.